I may have mentioned this before to you guys, but up until about 6 months ago, I never really paid attention to my skin. I mean, I washed it when appropriate and did what I could to clean my skin, but I didn't take any prevention for aging or anything like that. Why? Because I just never wore makeup. For many, many years, my only makeup was eyeliner and mascara - and that was it. I only put on anything else if I was going to have my picture taken. I have always been low maintenance where my skin was concerned. Until recently. As I'm getting older, I'm finding that now I want to take the time to care for my skin. That's why I'm glad I found Bioelements - I have really enjoyed testing out the products I have been sent. Today's post will be about the Flash Foam Cleanser, the ONLY cleanser I've used on my face for the past 3 weeks. "Gently exfoliates" are the best two words in the English language when it comes to skincare for me. I've used them all, I think - rough and tumble face wash that grates at your skin and smooth as silk soaps that don't have any grit to them. I prefer a combination - I want my skin cleaned, but not that the expense of 3 layers of skin. 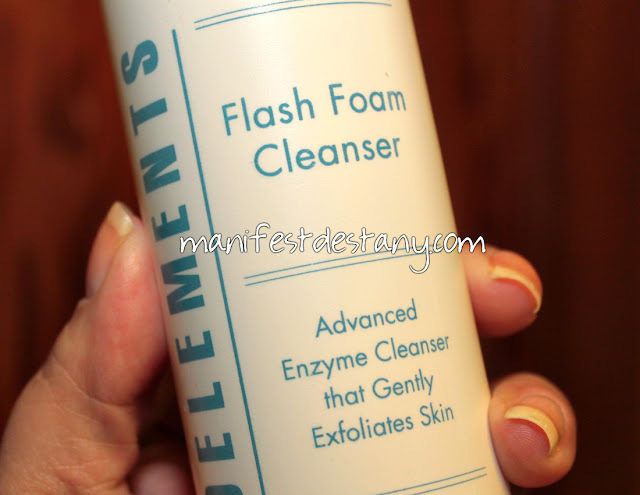 This one small pump of cleanser cleans my entire face and neck. Amazingly well. My skin feels so super soft when I finish with it! I don't have skin that is prone to sensitivity, but I tend to buy facial cleansers that are for sensitive skin. Why risk irritation even if I'm not prone to it? The thing I love most about this product is that it's for combination skin. My skin has always been combination, and I have had problems in the past with skin cleansers being perfect for my T-zone, but horrible for my cheeks or other parts of my face. This doesn't dry my skin out like other cleansers I've tried in the past. This is the happy medium I've been looking for. I follow up with my Own Anti-Aging Lifting Eye Cream and Own Skin Health Firming Silk Concentrate. My skin is so silky smooth all night long after I wash my face that it's amazing! I do still have a random breakout, but in the past 3 weeks I have only had one. DISCLAIMER: Some products used in this post were provided to me for consideration. This blog is written and edited by me, and the opinions are not influenced in any way. Please read this post for more information.